Frame-captured images from videotaped intravital microscopy of the mesenteric microcirculations of control and SCD mice. (a) Image of the microcirculation in a control mouse. Regular flow is indicated by uniformity of flow presentation in large (top right) and small (bottom) vessels, which is noticeably different from that in b. 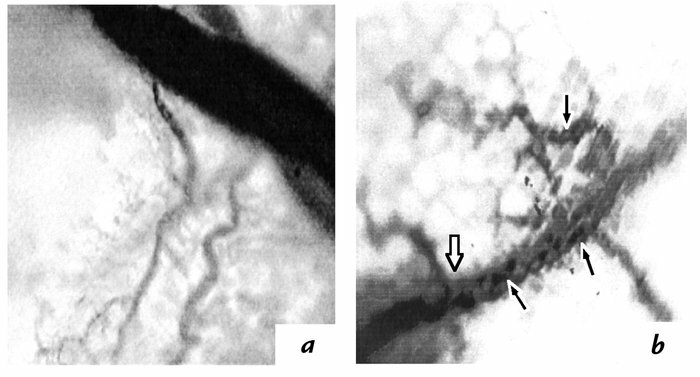 (b) Image of the microcirculation in an SCD mouse. Occluded blood flow is indicated by the abrupt transition between the dark, sludged (SS RBC–rich) blood below the open arrow and the lighter blood above it. Clumps of SS RBC apparently adherent to the wall of the same vessel also are visible (filled arrows). SCD, sickle cell disease; SS RBC, sickle red blood cell.